37 C.F.R. 1.935 Initial Office action usually accompanies order for inter partes reexamination. (ii) For purposes of paragraph (c)(4)(i) of this section, the term "joint research agreement" means a written contract, grant, or cooperative agreement entered into by two or more persons or entities for the performance of experimental, developmental, or research work in the field of the claimed invention. In view of the requirement for "special dispatch" in inter partes reexamination proceedings (35 U.S.C. 314(c) ), it is intended that the examiner will issue an ACP at the earliest possible time. Accordingly, the first action should include a statement cautioning the patent owner that a complete response should be made to the action. 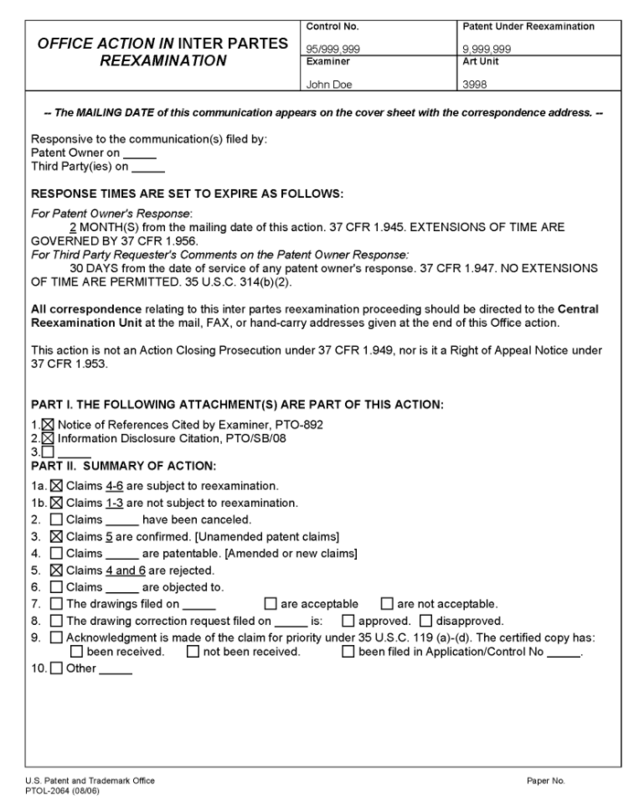 The first action should further caution the patent owner that the requirements of 37 CFR 1.116(b) will be strictly enforced after an ACP and that any amendment after the ACP must include "a showing of good and sufficient reasons why they are necessary and were not earlier presented" in order to be considered. Form paragraph 26.05 should be inserted at the end of the first Office action followed by form paragraph 26.73.